For almost two weeks I’ve been involved in a training for those headed overseas to teach, dorm parent, and administer schools and boarding programs for TCKs. I spend most of my days listening to lectures from my colleagues, drinking coffee of varying degrees of palatability (Java 101–very yummy; dining hall–not so much), trying to either stay warm or get cool (depending on the day), visiting with the people who are here from WorldVenture (my organization), meeting with the group I’m advising, and laughing uproariously with my roommates. It’s a good way to spend a few weeks. I did this last year and it was really good, but this year it’s even better. I think the difference is that this year I feel like the rest of the staff is family. Some of them have been friends for so long that they are family for all intents and purposes. I’ve had the opportunity to share some adventures with a few others throughout the year. And the rest? I’m just that much more comfortable around. I’m starting to think PFO is going to be a special reunion every year. That’s a great thing. 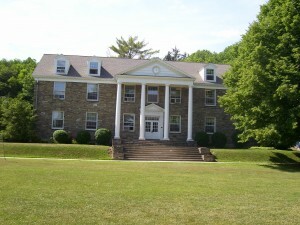 Houghton College hosts the training each year. We share the facilities with basketball camps, equestrian camps, string camps, alumni reunions, and alumni college. It makes for an interesting conglomeration of people at meal time. For a college town, Houghton has interesting distinctions—-two restaurants (one in the Citgo station) and a Subway sandwich shop, no police force, a gift shop that I’ve never seen open, , a smattering of houses, and the college. That’s it as far as I can tell. A few days ago as my roommates and I were trying to cross the street to get into the Student Center for breakfast, we encountered Houghton’s rush hour—7 cars passing the same point within a matter of less than two minutes. My parents graduated from here. My Mom caught my Dad on Sadie Hawkins Day. Without Houghton, I wouldn’t be here. It’s bucolic. It’s beautiful. It’s my history and my present. If things continue without much change in course, it’s part of my future, too. I plan to be back next year to help train more TCK caregivers, to reconnect with the PFO family, and to be reminded of just how I got here.